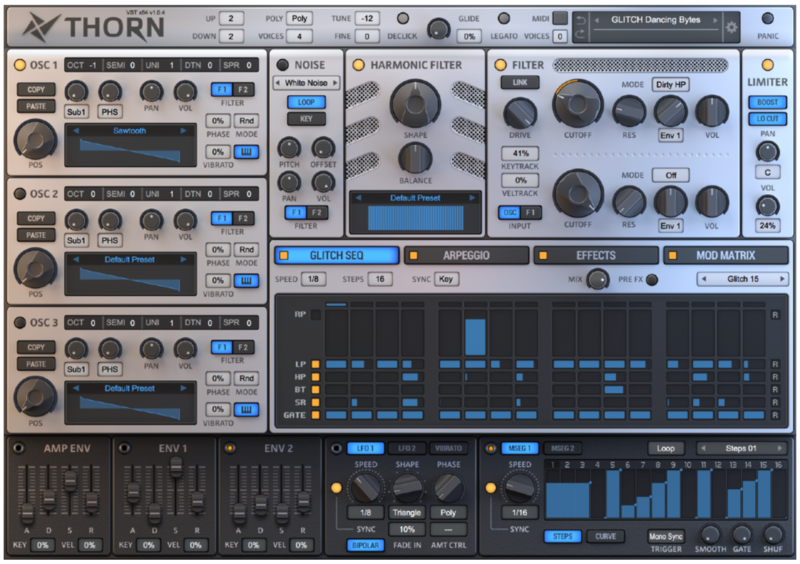 This article continues my celebration of independent developers with a look at the new synth by DS Audio called Thorn. The DS stands for Dmitry Sches, a software developer based in Minsk, Belarus. I asked him for a brief statement about his motivation and approach in creating Thorn. My first impressions of Thorn totally coincide with the developer’s vision. A quick run through the presets, organized by Bass, Lead, Pad and Sequence categories, yielded amazing sounds right out of the box. 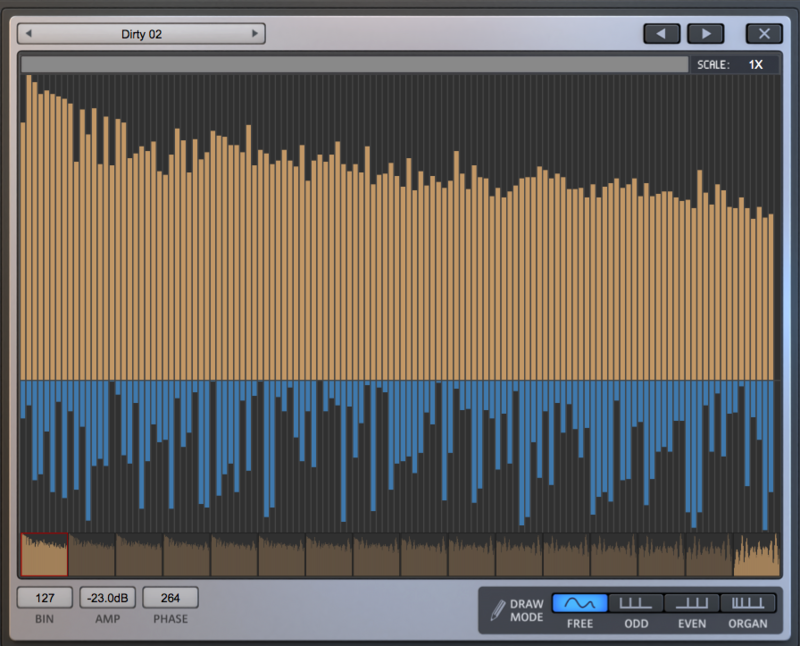 The percussive and biting aggressiveness of some the bass and lead tones seem to jump right out of my monitors. The pads include several lovely sounds with slowly evolving textures. The Sequence category features settings the highlight the use of the Glitch Sequencer. 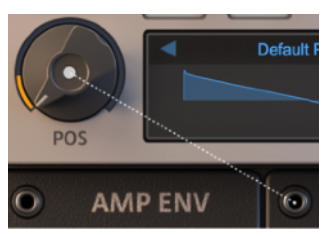 The standard global controls regarding tuning, polyphony, glide and pitch bend can be found along the top of the interface. There is a De-click button that will remove the click often associated with zero attack times. Clicking on the name exposes a drop-down menu where you can select the size of the GUI that includes large, huge and giant settings, a nice feature for the visually-challenged like myself. Using the Position Knob, the user can generate harmonics by selecting from the 16 frame spectrum tables. The available tables are organized by Basic, Classic, Metallic and Organic. Clicking on the wave table graphic opens an editing window which allows the user to freely edit amplitude (orange) and phase (blue) independently (see below). There is also a nice copy and paste feature that facilities duplicating settings from one oscillator to another, nice for making slight alterations or variations. 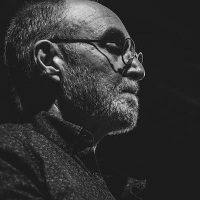 There is a dedicated Noise section that goes well beyond the standard flavors of noise and includes 19 noise varieties and other percussive sounds. 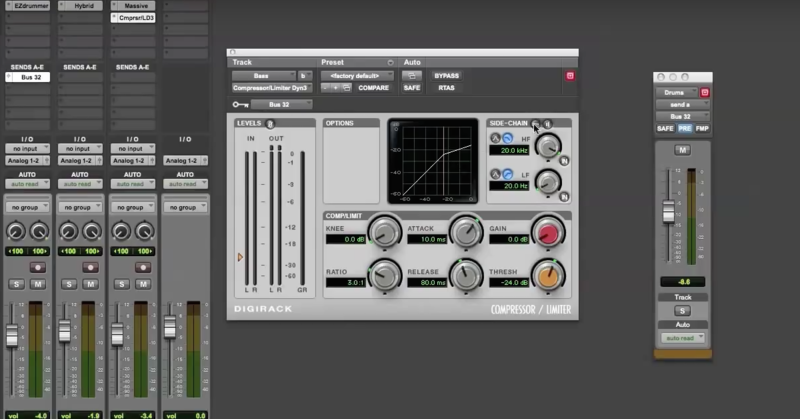 Sound can be routed thru a Harmonic Filter and two Multimode Filters before reaching the Limiter Section. There are three standard Envelope Sections, two LFO Sections and a Vibrato Section which could to modulate anything, including Pitch of course. There are also two Multistage Envelope sections with an array of preset patterns including curved functions. The Glitch Sequencer operates flawlessly and its controls are simple and intuitive. It offers six effects, each of which can be randomized by click the R button on the right of each lane. 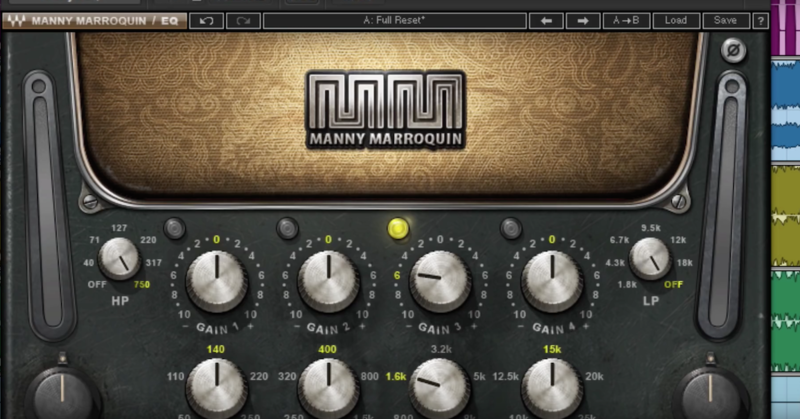 Generating a tasty and crunchy rhythmic loop can be accomplished with relative ease. There is an Arpeggiator section that offers the usual controls. Lastly, the onboard Effects section offers nine effects: Distortion, Lo-Fi, Chorus, Phaser, Flanger, Delay, Reverb, EQ and Compression. 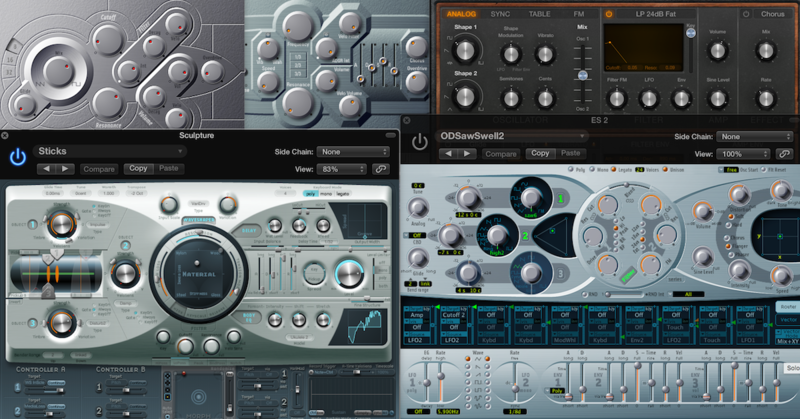 While there are certainly better effects available in myriad dedicated plugins, these modules sound surprisingly good and seem to include all the essential controls with an emphasis on simplicity. This makes it possible to insure that user presets will sound the same across sessions since they will require minimal post-processing. If I have any criticisms of this synth they are truly minor. It would be nice to have more extensive mouse-over hints for the controls. Drawing in the Harmonic Filter display was a bit unresponsive to the ODD and EVEN harmonic drawing modes. But on the whole this is a great instrument that can cut through any mix with ferocity. 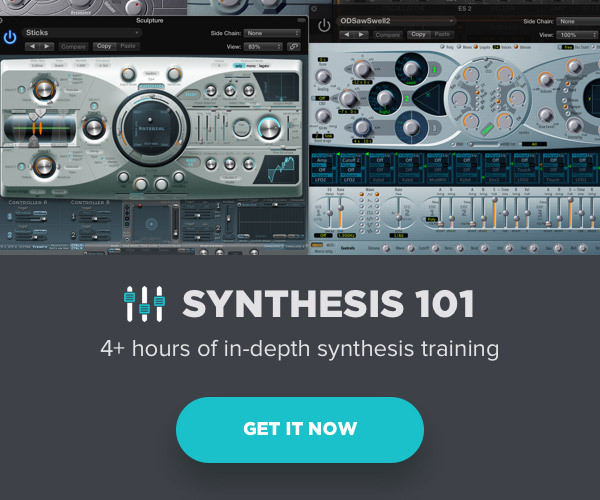 For anyone that uses soft synths, this instrument definitely deserves a place in your arsenal. And for the price (currently offered for $69 until the end of the year) you will not be disappointed. It also might be worth exploring other offerings by DS Audio including: Tantra and Diversion. 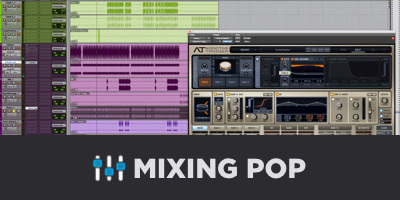 Please check out my other articles in The Pro Audio Files. 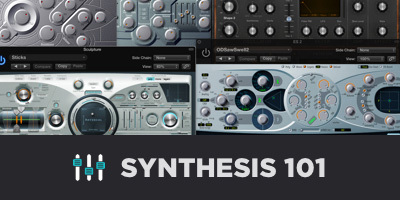 If you’re new to synthesis or just want to expand your knowledge and fill in some gaps, consider my video tutorial series Synthesis 101 available exclusively on The Pro Audio Files.